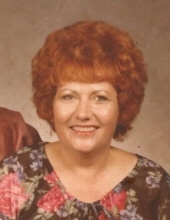 Virginia Lee Hannon (Burt) was born in Thayer, Kansas on September 14, 1932 to Joesph Samuel Burt and Buda May (Whiseman) and died at the age of 86 on September 17, 2018 of natural causes. She graduated from Thayer High School in 1950. She was a resident of the Cherryvale Nursing and Rehabilitation Center (Kansas) at the time of her death. Ms. Hannon was formerly married to Kieth Reddington, James L. Hannon and Robert Murrow. She was divorced from all three. Virginia worked in food service for several years before returning to post-secondary training in cosmetology. She eventually opened Aquarius Beauty Salon, first in Edna, Kansas then moving it to Coffeyville. She was preceded in death by parents, sister Marylin Brewer, brother Joe Burt and her daughter Laura Ann. She is survived by her Sister Reola Mansfield (Burt) and sons James Wade Hannon of Tahlequah, OK and Justin Lee Hannon of Cherryvale, KS. She has eight grandchildren, thirteen great-grandchildren, two great-great-grandchildren and several nieces, nephews and their children. Some of Virginia's favorite activities were playing bingo and going to casinos. Her memorial service will be at 6pm on Monday, September 24th at the Wickham Family Funeral Home, 216 East 4th Street, Cherryvale, Kansas. A meal will be served by her family at Logan Park building on Liberty Street in Cherryvale, Kansas. As she requested, her body will be cremated. To send flowers or a remembrance gift to the family of Virginia L. Hannon, please visit our Tribute Store. "Email Address" would like to share the life celebration of Virginia L. Hannon. Click on the "link" to go to share a favorite memory or leave a condolence message for the family.